So you want to get AdWords certified? This article aims to give you with information on everything you need know about how to become Google AdWords Certified Professional. In the beginning, Google initiated Google Advertising Professionals but then changed to Google AdWords Certification. They keep changing the program names, and the latest was Google AdWords Partners. The Google AdWords Partners Program can be taken by any individual or agency. In order to get certified as a Google AdWords Professional, one needs to complete Fundamentals exam and another additional exam. It is a series of examinations developed by Google through which marketers can gain recognition as online advertising experts or PPC experts. After passing two certification exams, one will receive a personalized certification that appears on a public profile page as a Google Partner. Previously it was a standalone program and a cost attached to taking the examinations. The Google AdWords exam fee was around $50 or $100 initially. But, luckily now the exam can be taken at free of cost, but there are some time constraints. For AdWords Fundamentals, Search Advertising and Display Advertising you will have to answer 100 questions with a time restriction of 120 minutes. Whereas for Mobile Advertising, Shopping Advertising, and Video Advertising you need to answer 70 questions in 90 minutes. You need a minimum score of 80% to pass the exam, and in case if you fail, you can retake the examination after 7 days. Step 1: Anyone with practical knowledge in working with Google AdWords or who studied the Google AdWords Exam Study Guide can easily pass the examination. Step 2: Go to Google Partners website and click join Google Partners Program. Step 3: On signing up, you can login to the program and choose the option “AdWords” from the left menu. Step 4: Take the Fundamentals Exam since it is mandatory. Where to get the Google AdWords study materials? Google AdWords Study Guides: Take advantage of Google’s own study guide! Well, the entire internet is available to learn and explore. However, the exam guides are available under the respective study sections in Google. You can access them at free of cost! The exams are easy to pass if you have an in-depth knowledge of theoretical and practical knowledge given in Google AdWords Exam Guide. Google AdWords Practice tests and mock-up exams will help you in getting to know how much you know about the subject. By taking these Google AdWords practice test and mockup exams, you will know about: What kind of aspects in AdWords you want to be focussing on to understand better and how the AdWords exams will be formatted and presented. With 90 questions very similar questions to the actual AdWords exams and explanations, it seems to be the bread and butter for taking mock-up tests for Google AdWords exams and answers. With 50 questions in practice exam, GyaniAkash is quite helpful for those who need a simple practice mockup test. But it seems the wordings are not very clear, and the answers to some questions are incorrect. Though it is not free, you can try the free trial to check the overview of some exams and look into some questions. Their questions are accurate and look more similar to actual AdWords certification exams. How can you stay Google AdWords Certified? Unfortunately, the Google AdWords certifications are not valid for lifetime. A passing score on the exam will be valid for 12 months only after the exam date. You have to renew it by retaking the exams. 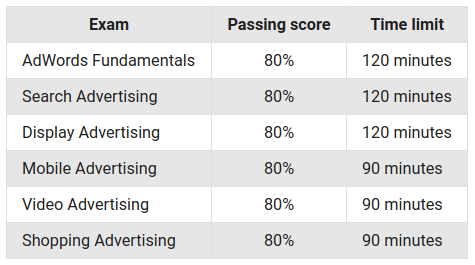 If you want to maintain the certification status, you need a valid passing score on Google AdWords Fundamental exam and one of the other advertising exams. Are you wondering what exactly is the Google partner tag and how it is different from Google certification? Basically, agencies get partner tag while individuals just get certified. To earn the Google Partner badge as a company or organization, you have to get certification, acquire clients and invest some amount of money (at least $10,000 over a period of 90 days) in your MCC (My Client Center) account to run Google advertisements. Once you pass the Google AdWords examination, you will be receiving a personalized certification and a Google Partners public profile page along with the list of certifications you have earned. 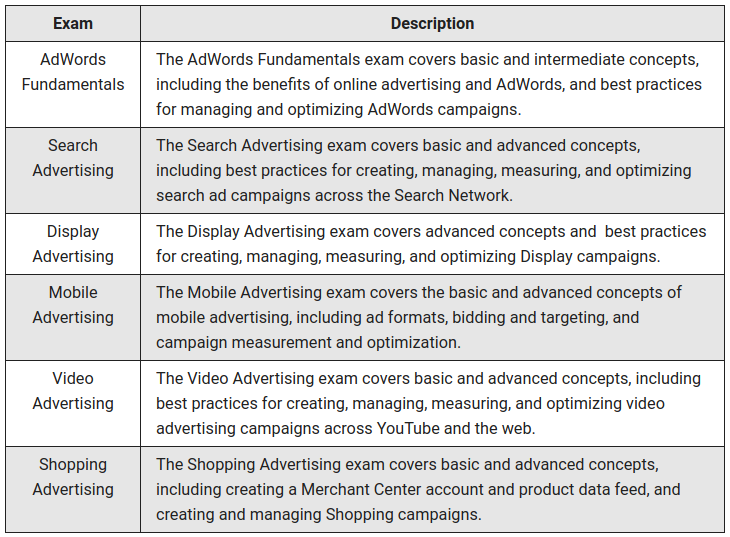 So are you ready to take the AdWords certification exams? Test your advertising skills, pass the exam, get certification and become a Google AdWords Professional. How can Zuan Education help you to become a Google AdWords Certified Professional? Want to prepare for Google AdWords Certification? Now is a great time to get certified! Zuan Education has up-to-date modules in Google AdWords Course for you to show how you shall learn everything in practical. We will teach you everything right from fundamentals to advanced concepts to master Google AdWords. Call 9025500600 to learn Google AdWords Certification Course or Visit our AdWords Training Page >>> http://bit.ly/AdWords-Course <<< for more details. 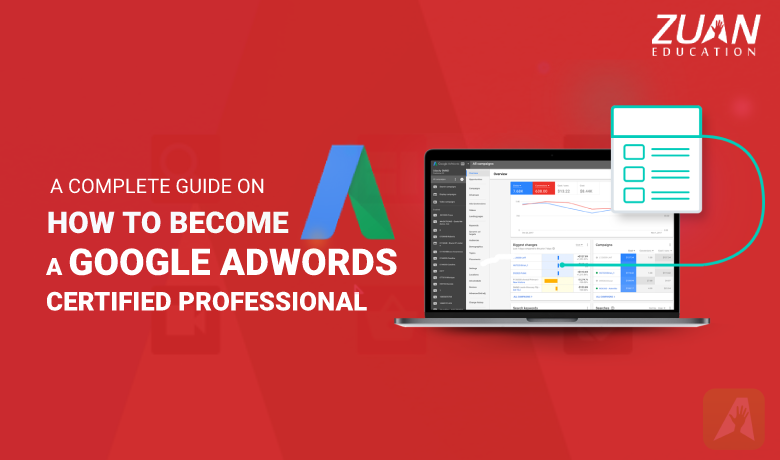 Hope this guide will help you to set your dreams for success in becoming Google AdWords certified professional. The world is looking for another expert, and maybe you are the one!